Apologetics is seldom funny. In part that is because souls are at stake but also because apologists are often grumpy and argumentative. So a book that is easy to read, clear and jammed full of quips, anecdotes and good arguments is refreshing. Andrew Wilson is a Brit, a pastor and, as it turns out, a good writer. His contribution to apologetics is novel not due to any originality in terms of content, but due to a conversational style that will help even the most non-apologetically inclined reader get to the end of the book. 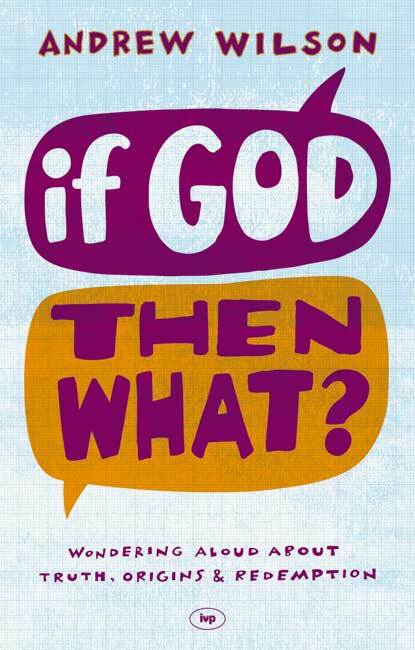 If God Then What? Begins with Wilson's journey from "fundamentalism," the belief that one is right whether or not the evidence supports it, to seeking to provide reasons for Christian belief. Wilson then sets out his case for an inference to the best explanation method: "One, we identify what the evidence is; two, we establish the possible explanations; and three, we see which one explains the evidence more completely, simply and coherently that the others" (p.47). Wilson then presents three lines of evidence that require an explanation. First the "fine-tuning" of the universe, the fact that the chances of a universe emerging that supports life and is the way it is are so inconceivably small demonstrates that it is very unlikely that it was a chance event at all. Second, Wilson examines consciousness. How is that we think in the way we do? Wilson argues that it is much more probable that such mental activity derives from being created by a supreme mind than being the result of chance and matter. Finally, Wilson defends the possibility of the miraculous, arguing that at least some claims to have witnessed miracles should be taken seriously and the best explanation would be a divine intervention. The next section of the book cleverly combines three more areas of apologetic argument with the telling of the gospel. First, Wilson reflects on the explanations for evil being in the world. This chapter combines a defense of the problem of evil (Wilson gives a brief "free will defense"), an explanation for our ability to recognize evil and leads the reader to recognize his or her own part in evil. Second, Wilson asks us to imagine redemption. He does this by imagining London as it would be if there was no sin: "There's no hatred in Tower Hamlets, no greed in Kensington, no jealousy in Primrose Hill and no lust in Soho" (p.122). Wilson's excursive into cultural critique (somehow, being an ex-Londoner, those pairings ring all too true) helps one link evil in abstract terms to real contexts. Since it would be impossible, Wilson suggests, to redeem ourselves, we would need a divine savior to do the job for us. After imagining what kind of divine help would do the trick, Wilson points to Jesus as fitting the bill. Finally, in this section, Wilson offers a fairly standard historical defense for the resurrection of Christ. Wilson ends with an appeal to the reader to consider how all the evidence should make an impact on the the way the reader thinks about the claims of Christianity. Of course, Wilson remarks, all the evidence supplied thus far cannot take you all the way, but when you think about God in a less evidence-for-or-against way and in a more personal way the gap left can be made up for by trusting in such a person. "in a world like this, no amount of frantic searching would be able to strip them of their abiding, resilient beauty, the creativity, laughter and empathy that come from being made in the God's image. But it would always be a beauty scarred, scuppered and soured by the loss of God, like a Titian painting with obscenities scribbled across it, or a lemon drizzle cake with a hornet in the icing" (p.107-108). Wilson's apologetic method might not be to my taste, but a good dose of anecdote, wit and autobiography makes reading Wilson enjoyable. It is also a challenge to grumpy, argumentative people like me to take time to think of a way to say something in a less, well, grumpy and argumentative way. As to Wilson's argument. He follows a fairly standard routine. First, a teleological argument for generic theism and then a mostly evidential/historical argument for Christian theism. Most would recognize this from apologists such as William Lane Craig. However, Wilson is less trusting of deductive arguments and emphasizes a cumulative case approach combining arguments for theism with arguments for Christian theism. Wilson's final chapter on faith is somewhat revealing of his method in general. Acknowledging that none of what he says is any more than an argument that it is probable that Christian theism is true, Wilson asks the reader to make a small "leap of faith" to go the rest of the way to all-out belief. This is justified not because that's all we have left, but because of the personal nature of God. He can be trusted because of who he is. The book might be useful for engaging non-apologetically minded people with technical arguments. Its autobiographical nature also means the book defends the faith through personal testimony. This, for some, is far more convincing than technical argumentation and analysis.